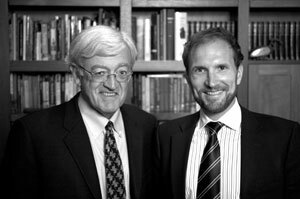 Peter I. Yanev (left) has more than forty years of experience in earthquake and structural engineering, and risk management. In 1981 he co-founded EQE International, a global risk management provider, and grew the company to 750 professionals before leaving in 2001. He currently advises organizations worldwide, including engineering firms, the World Bank, the Massachusetts Institute of Technology, and the University of California, Berkeley. A former president of the Northern California chapter of the Earthquake Engineering Research Institute, Yanev has performed more than one hundred earthquake investigations, has published extensively, and is a frequent media commentator on natural disasters. He holds degrees in structural and earthquake engineering from the University of California, Berkeley, and the Massachusetts Institute of Technology. He lives in Orinda, California. Andrew C.T. Thompson (right) is an earthquake engineer and risk management consultant with the global engineering, planning, and consulting firm Arup. He has assessed, analyzed, and contributed to the design of numerous high-rise buildings, transportation facilities, offshore structures, and complex manufacturing facilities. He has worked with corporations and governments around the world, advising them on earthquake risk management issues, from risk reduction and insurance to business continuity. Thompson has published numerous articles related to earthquake engineering and risk management, has contributed to technical books on the subject, and is a frequent commentator to the media. He holds a Master’s degree in structural and earthquake engineering from the University of California, Berkeley. He lives in San Francisco.